Google My Activity is a feature that will show you all your past activity on your Google account. You will find all the history of your Google account activity like; websites you visited, search terms you have used, apps (Facebook, Whatsapp, youtube etc.) you have accessed, the places you have visited and lot more. My Activity feature on google also will show your activity in details like; on which day, what time, and on which device the activity was performed. You can see your activity in two views. One is Bundle view, which categorizes your data and other is Item view, which will show you each individual activity with details. The good thing is that this activity can be accessed only by you. But the bad thing is that even if you deleted your browser's browsing history you activity will still exist in Google's "My Activity" history. 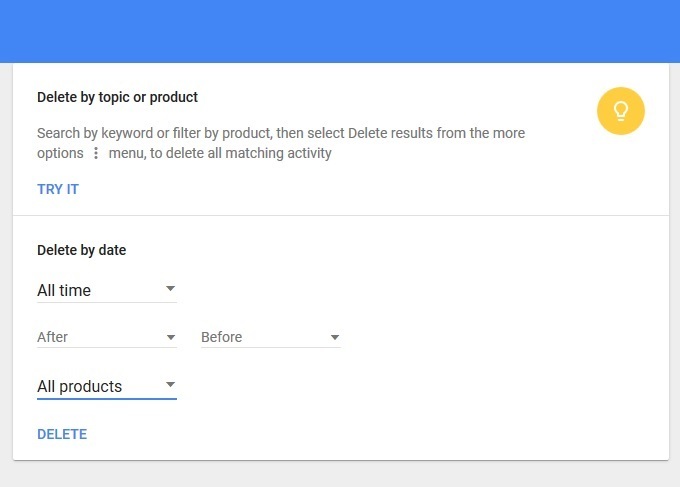 If you want to delete all your Google account past activity then this step by step guide will help you to delete all activity related to your google account. Also Read: How to disable Google location History. Remember this process will permanently delete all your past user activity related to your google account. And your recorded past activity cannot be recovered again. At first Log into your google account. After logging into your google account go to https://myactivity.google.com/myactivity . From the left sidebar menu click on "Delete activity by" tab. Now you will see the delete activity wizard. You can choose any date range to delete your activity for a particular period of time. Also, you can choose a particular product to delete. If you want to delete all of your product's past activity from the beginning of time just select "All time" and "All products". Now click on "DELETE" to delete your past activities. You might get a confirmation message to delete your activity. Just agree and delete to successfully delete your activity. Also you can pause further recording of future activity from this link : https://myaccount.google.com/activitycontrols .